When I first heard about Bo’s from Gothamist, I knew I had to try it. First, it’s located in the neighborhood where I work, which is a definite advantage. Second, and more important, it shares the name of my most wonderful kitten. As soon as I read about Bo’s, I called them up and made a reservation for Friday night. Bo’s is a long narrow restaurant serving up Bayou specialities situated on 24th Street, just beyond the Italian delicacy mecca that is Eataly. In the front, there is a bar frequented by the creatives of the district, all sipping the fine cocktails Bo’s has to offer. When you walk past the bar and into the rear of the restaurant, the place opens up to a wonderful interior, lit with just the right amount of illumination. It’s a beautiful space, for sure. After a few minutes, we were served monkey bread, which is basically a fantastic white bread with much more salt and butter than your average loaf from the supermarket (or even than what you’d make homemade). We received four pieces, and I ate 3.5 of them. That’s how good it was. 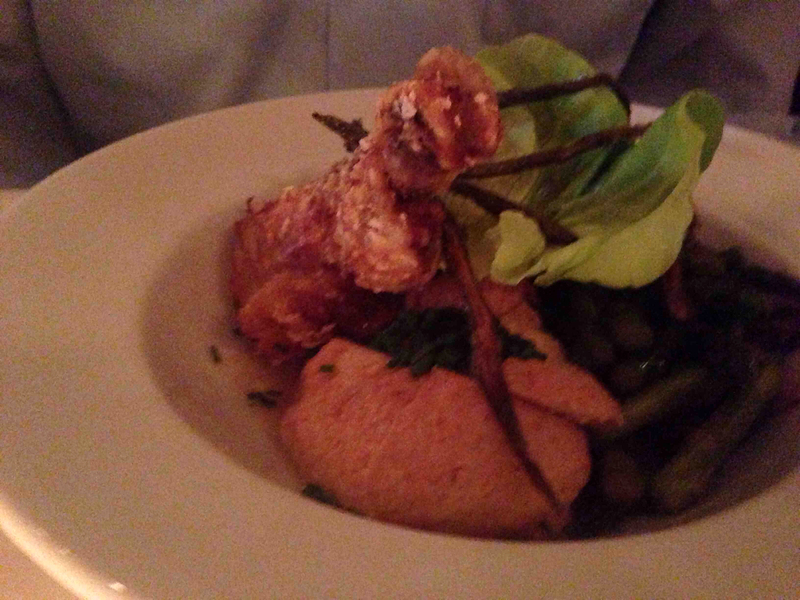 We began our meal with the crispy alligator. Sounds … reptilian, no? It was amazing. 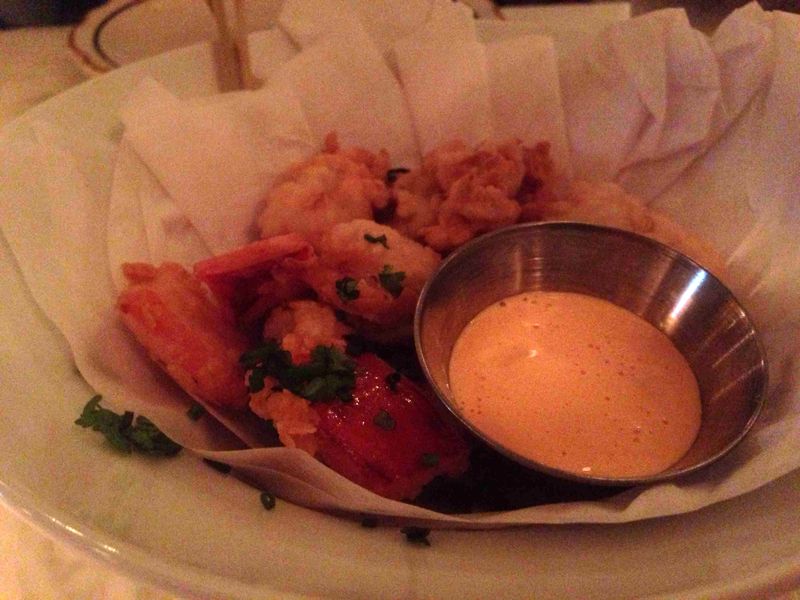 Lightly battered pieces of alligator were mixed among chunks of red pepper with a creamy chili aioli on the side. The alligator was not at all what I had imagined. It was chewy and flavorful, and the chili aioli was the perfect accompaniment. You must try the crispy alligator at Bo’s. For my entree, I ordered the perfectly cooked (medium) skirt steak with a French feta sauce drizzled on top and the most perfect mashed potato puree, inflected with hints of bacon, positioned underneath the steak. To round out the dish, I also received a hearty portion of fresh carrots that were roasted with honey-glaze. It was sublime. My Dining Partner (MDP) opted for the buttermilk braised fried chicken, which was enormously flavorful and delicately battered. Oddly, Bo’s serves the fried chicken with asparagus, rather than a starch. I suppose the buttermilk biscuit (delicious!) that comes with the dish supplies the right amount of carbs the patron could desire. MDP greatly enjoyed his dish, finishing off the very last bit of it. I knew we had to order dessert since they had pumpkin beignets on the menu. They were quite good, although not the highlight of the meal (which, though everything was very good, may have been the monkey bread for me). The fried balls of dough were rolled in granulated sugar, and were filled with pumpkin goodness. On the side, we were served a maple sugar ice cream that wasn’t particularly sweet, but had just the right hint of flavor to it. Very good. I implore you to try Bos’. You certainly won’t be sorry. But bring a good credit card; it’s a tad pricey. Take the N/R to 23rd Street. Walk north one block and turn left onto 24th Street. It’s on the south side of the street.